CHICAGO – The oil boom has enabled Saudi Arabia and Libya to become the power centers of Islam's new international political thrust. Since about 1970, they have possessed the wealth to advance Islamic interests with the same means that the Western and Communist powers use: military aid, economic pressure, cultural presence. Standing aside from the struggle between the West and Communism, and moving toward different goals, this Islamic current often goes unnoticed. Saudi Arabia and Libya have established networks reaching into dozens of countries, with a major impact on a sizable number of them. In contrast to the other Moslem countries with large disposable financial reserves (for example; Kuwait and Algeria), Saudi Arabia and Libya share a heritage of fundamentalist activism that reflects the desert's harshness. Their regimes echo doctrines developed in, respectively, the 18th and 19th centuries. The Wahabi movement has dominated politics in Arabia almost uninterruptedly since 1745, imposing a harsh, uncompromising legalistic version of Islam. Libya is the home of the Sanusi brotherhood; founded in 1837, it provided an organization for the 1911-1943 war against the Italians who occupied Libya. Both movements have consistently expanded their vision of Islam by aggressive, often militant means. They still do so. 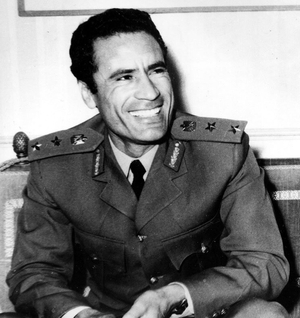 Although Saudi-Libyan relations have been persistently bad since Muammar el-Qaddafi came to power in 1969, and although the two Governments have contrary political objectives and temperaments, they both work to promote Islamic causes. These differences are indeed a strength, for they complement each other. While Saudi Arabia follows conservative, pro-Western policies and maintains the sage dignity worthy of the protector of Mecca and Medina, Libya under Colonel Qaddafi engages in passionate subversion, working to foment revolutionary change. While Saudi Arabia nudges governments toward its own viewpoint by diplomacy and promises of aid, Colonel Qaddafi slugs them by supporting extremist groups, sabotage and terrorism. While each pursues its own course, together the two Governments further Islam on all fronts. Their efforts reach through the Moslem world, from the Western (formerly Spanish) Sahara to the Philippines. By loans and grants amounting to many billions of dollars, Saudi Arabia exerts enormous pressure on recipient states. Normally this is done discreetly, yet the pattern is unmistakable. In Morocco, the Saudis brought King Hassan II to condemn the Egyptian-Israeli peace treaty, which he had helped to bring about; in Lebanon, they imposed a truce on the Syrians and the Moslem-Palestinian-leftist forces in October 1976; they bought Somalia out of the Soviet camp; they made northern Yemen renounce its radical programs; they are putting pressure on Persian Gulf states to follow Islamic law more scrupulously; they support the National Salvation Party, a religious party in Turkey; their aid to Pakistan and Bangladesh implied religious conditions and there were striking results; and they have offered the Filipino Government aid that would follow solution of the Moslem problem on Mindanao to Saudi satisfaction. Libya's Qaddafi operates in many countries. Libya, too, makes loans and gifts of money to governments but Colonel Qaddafi prefers covert activities – aiding coup attempts and separatist movements, running guns, kidnapping. He has helped Moslems fight Israelis and fight non-Moslems in the Spanish Sahara, Chad, Ethiopia, Lebanon, Thailand and the Philippines; he has worked to overthrow Governments in Morocco, Tunisia, Egypt, the Sudan, Jordan, Turkey, Iran, Afghanistan and Oman; he has funded and armed Moslem fanatics in Egypt, Turkey and Indonesia; he pressured the poorest states of Africa to promote Islam by offering aid in return; and he has acquired a major political role in the internal affairs of the Central African Republic (formerly Empire), Uganda and Pakistan. Recent reverses in the Central African Republic, Uganda and Chad, and signs that Colonel Qaddafi is withdrawing his support for terrorism, may indicate a shift in his tactics, though his commitment to turmoil remains unchanged. Saudi Arabian and Libyan activities have contributed substantially to the increase of political activity in the name of Islam. So long as their oil revenues remain high and the current regimes stay in power, Moslem countries from West Africa to Southeast Asia will continue to feel their pressure toward Islam. Daniel Pipes teaches Islamic history at the University of Chicago.